It’s wondrous to me that my ‘Linda’ lily throws fiery flame orange sparks every May, whatever Texas weird weather throws her way. But what an odd year! Since passion vine didn’t freeze back (and is insanely out of control), butterflies cheered at such early abundance. Another plant that remained evergreen for me is Gomphrena ‘Grapes’. The first time I saw its vivid miniature globes on a November nursery trip years back, I went for it. Yes, it really gears up in fall. Sold under several cultivar names, including ‘Itsy Bitsy’, ‘Teensy Weensy’, and ‘Little Grapes’, Daphne makes it Plant of the Week for its prolific flowers on shrub-like growth. Hardy to USDA Zone 8, usually it freezes to the ground for us and returns in spring. In the Travis County Extension Office demonstration beds, it’s been reliably evergreen for four years. Daphne advises to plant in full sun and water moderately for best performance. Find out more about Gomphrena ‘Grapes’. In the case of her plum tree, ‘Bruce,’ planted in honor of her mother, we simply don’t get enough chilling hours. Find out more as our Question of the Week. Fairy gardens do their cute little thing regardless of weather. This week, John charms us to pieces with carefully crafted truly downsized designs. Faster than a time warp to the past, I spiraled back into childhood, tempted to get in John’s way to arrange every little scenario. There’s a tiny garden of imagination for every style. Containers are perfect venues for your inner child wonder. You know what I spotted first! Count on it: I’m adopting some of these bunnies. We can’t control the weather outside, but we sure can do it indoors with terrariums. Tom meets with Keri Anderson from Slavonk and Hortus Terraria to style up big with tiny enchantments for easy care indoor gardens. Wardian cases originated in the early 1800s as a safe way to transport plant discoveries from around the world. Today, we’ve revived their classic lines for stunning terrariums. Keri had us hooked with gardens-in-a-globe that pep up office time, even in lower light. Plus, you never mess up the break room sink (or your computer) with watering. Tell your story in cozy fairy gardens, this one fitted with Yoda per the latest Star Wars movie. From first-hand experience, Keri steers us clear of terrarium mistakes, like too much sun or too much water with succulents. Slavonk and Hortus Terraria can build your indoor dream garden or you can go nuts at the Terrarium Bar to craft your own. Native spiderwort sports small flowers in spring, though its botanical name (Tradescantia gigantea) refers to its height. Viewer Pic this week goes to Victoria Dawson in Lakeway for her outstanding plants. 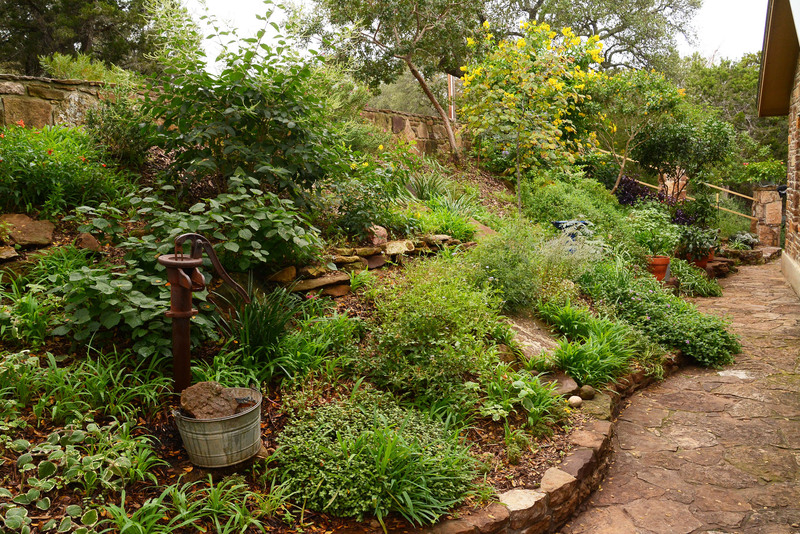 Last year she enrolled in the Go Native U Native Plant Gardening courses at the Wildflower Center. Since then, she’s removed much of the lawn for a native plant showcase that’s upped her pollinator count. On tour, Laura and Travis McGarraugh dumped the lawn for new family fun with ponds and an outdoor living room. For Laura, an emergency room nurse, the ponds are personal therapy after 12 hour shifts. But the whole family loves naming the fish and watching wildlife in their serene at-home getaway. Daughter Naomi joins her mom for grand ideas in containers. Especially she loves designing pots of succulents, already an artist with tiny wonder. And help us create beautiful days on CTG with your support! PLUS, every donation is entered into a fabulous giveaway package! Find out more right now.